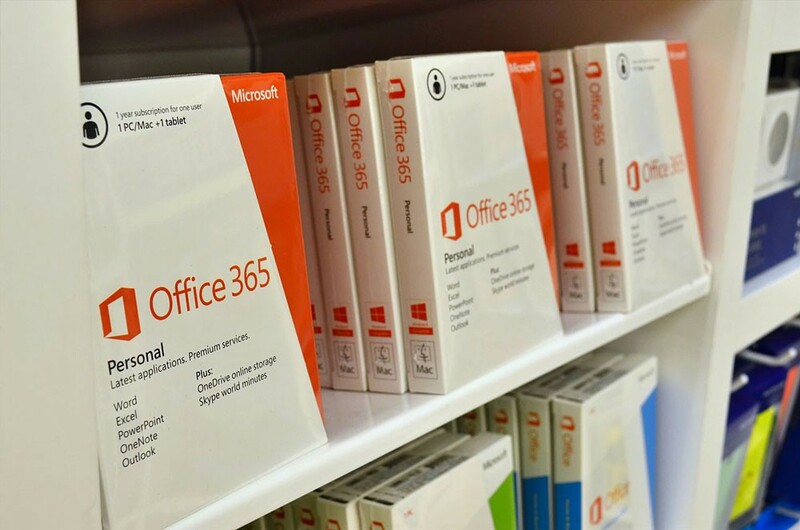 This month I could experience the new Microsoft Office 365. Microsoft designed the Office 365 platform to bring together its existing online services (such as the Business Productivity Online Suite) into “an always-up-to-date cloud service” incorporating Exchange Server (for e-mail), SharePoint (for internal social networking, collaboration, and a public web site), and Lync (for communication, VoIP, and conferencing). Plans were initially launched for small business and enterprises; the small business plan offered Exchange e-mail, SharePoint Online, Lync Online, web hosting via SharePoint, and the Office Web Apps, with the enterprise plan also adding per-user licenses for the Office 2010 Professional Plus software and 24/7 phone support. 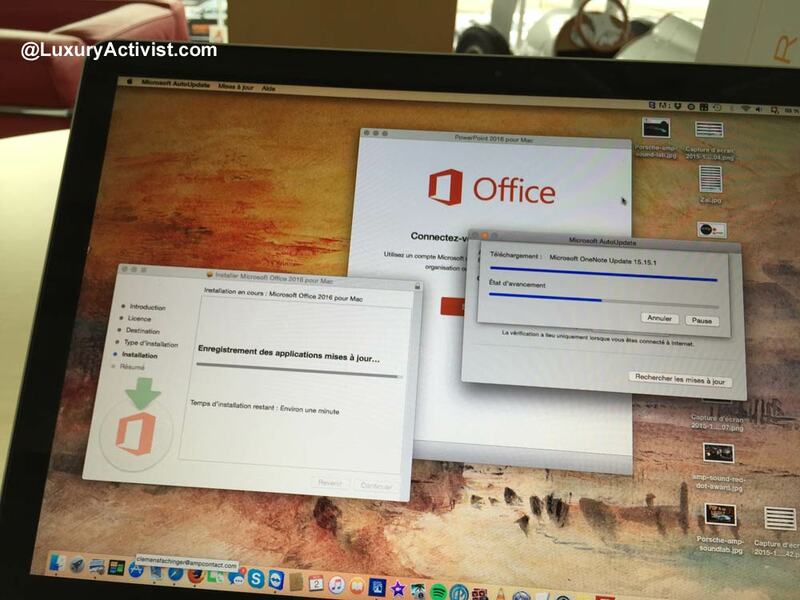 During one week, I tested Office 365 in my daily routine as a blogger. 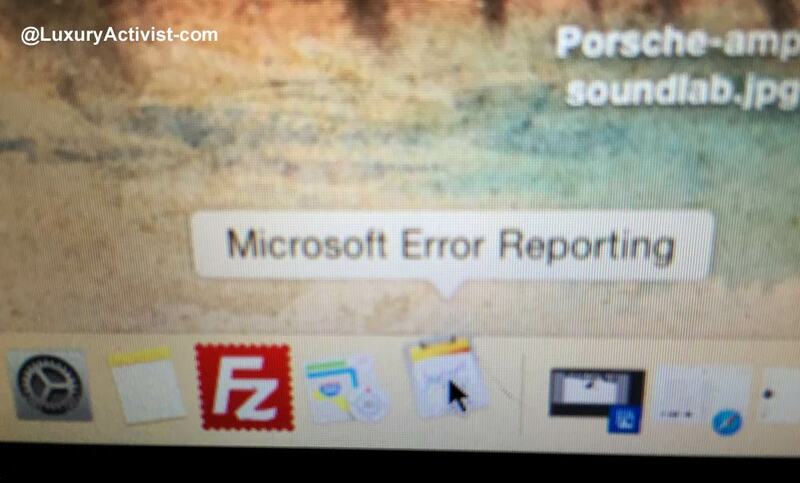 The goal was to see how Office 365 would be improving my life of online editor. See here my full review. Macbook Pro 15″ OS 10.10.1 Yosemite, 2.5 GHz Intel Core i7, 8Go. iPhone 6 IOS 9 installed. 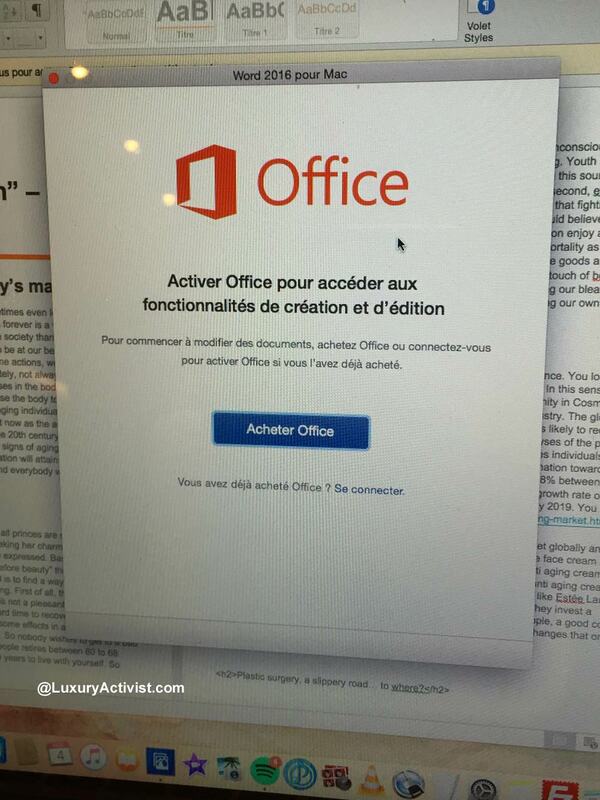 Microsoft Office 365 is by far the best user experience on Mac of an MS Office until now. The layout and the functionalities are all there. The Installation and the set up is pretty intuitive and quite adapted to a mobile person. Unfortunately the installation did not work perfectly for me, it was not very clean. After a whole week, Office was still asking me to activate the pack online. 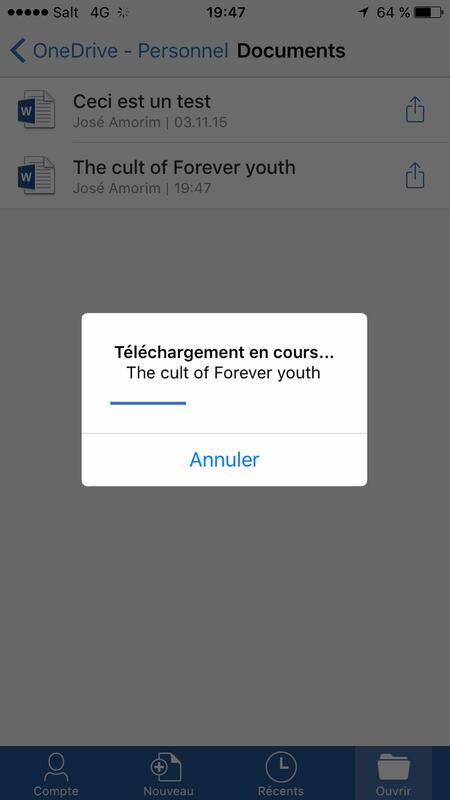 Please note that the Mac version does not includes Access and Publisher in the suite, which is included in the PC version. The OneDrive experience is great but not better than any other possible “private” usage of iCloud or DropBox for a Mac user. If you are a PC user you will definitely be happy with it. I believe that MS Office 365 is adapted for a Professional client that might use all the features like sharing documents, skype or sharepoint features, etc. Last but not least, it is on an annual subscription. So if you do not pay every year, all the softwares get into “read-only-mode” so you cannot edit or create new documents. The main goal is to have a pretty fair license price with a very large cloud stockage. That is why for me it is a Professional tool above all. In conclusion: the best Office experience on a Mac ever but a product related to a professional customer. 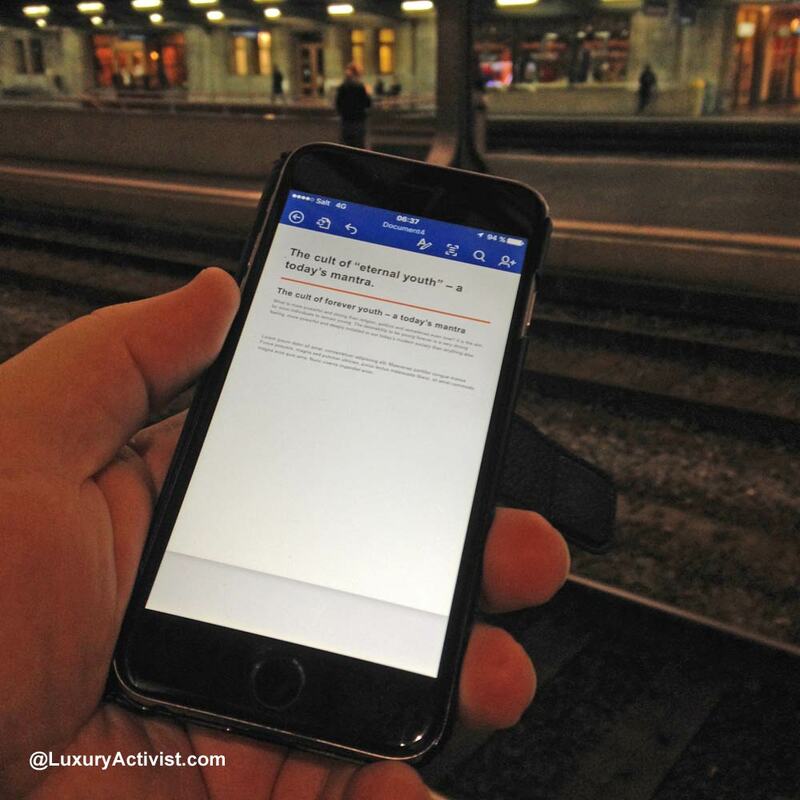 As a blogger, I usually write articles from different locations: home, public transports, bars, events, etc. So the goal of the test was to write a 1500 words article during a week. 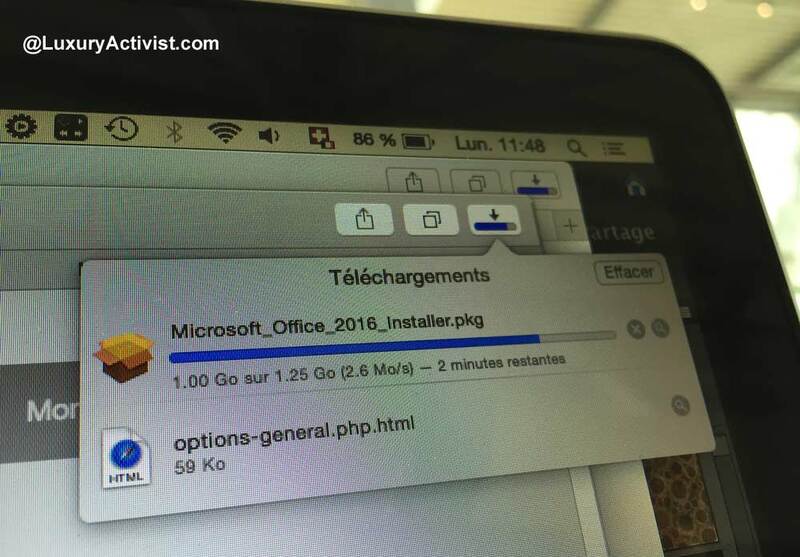 And it all started with the new Office 365 download. 1.25Go for the installation package. I first tried on 4G, the download panel said 25hours. I found a better choice to ask for the WiFi password of the place where I was. Basically in 10mn it was done. Once all the package was downloaded, just needed to follow the step by step process. I needed to connect with a Microsoft account, which I did not have. So I created one. And the installation process started. 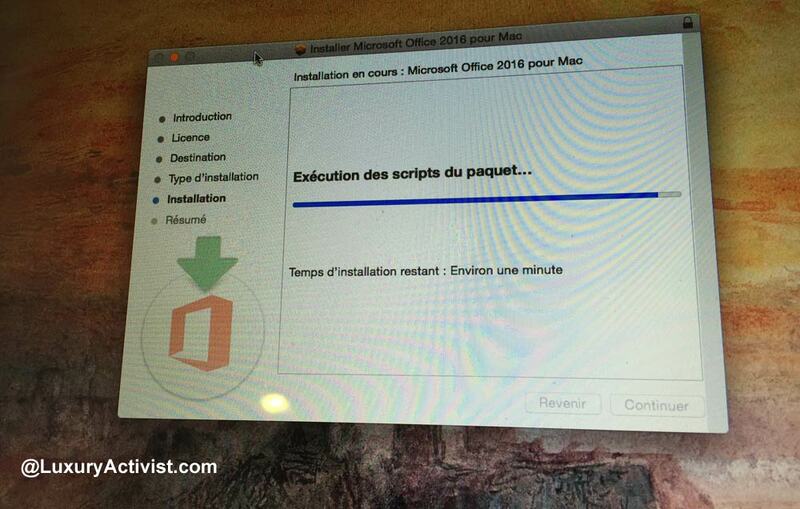 During the installation process, I got a pop-up window from Microsoft updates saying I needed to update Office. I could not skip the window, so I thought it was a normal part of the installation process. And then my issues started. The MS update never finished and the installation process froze. I got stuck during several minutes with the following panel on my screen. It was saying remaining time one minute. After 20mn I decided to kill the installation process and restart all over again. I did the MS updates first and then I opened the installation process package. If Microsoft is reading this, you might want to check possible interactions between MS updates and the installation of the new package. After doing the installation a second time, everything worked well, so I could launch word and start writing my article. I must confess that I am pretty much confortable with IT issues. I would not imagine my father or mother in the middle of the messy installation. What we must see here is that the previous 2011 Office I had was replaced by the new one. So no way to go back as I do not even have the box with the CDs anymore. 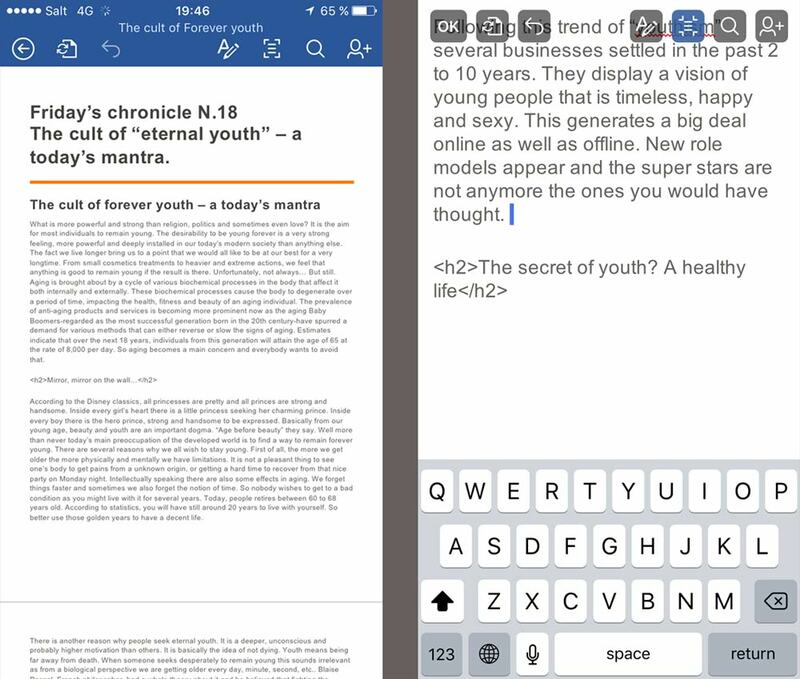 Anyway things seemed to be fine so I started immediately to write my new article on Word. 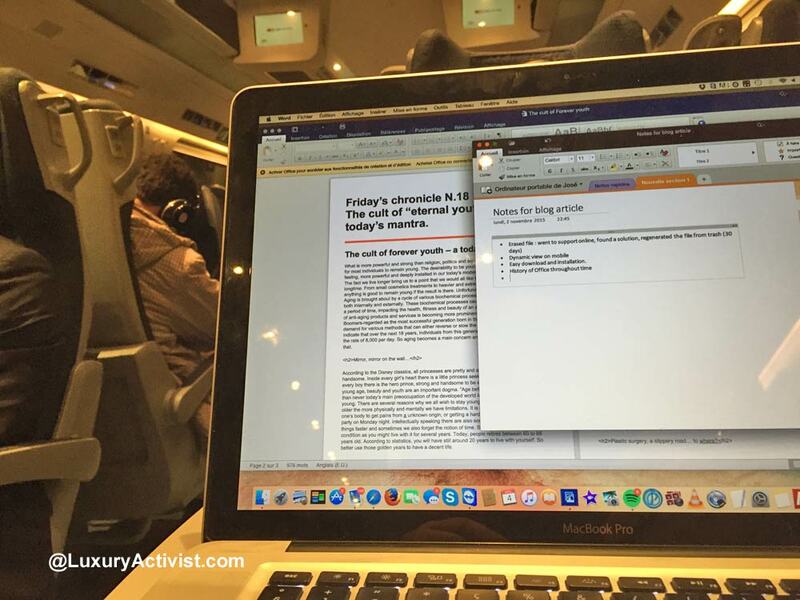 My week was then orchestrated by several moments of writing, in the train, on desktop then on my mobile, back to desktop…. Basically a nomadic multi-screen life. As expected, I could access my documents stocked in the OneDrive, the Microsoft cloud, from anywhere with my different devices. I used mainly Word and also MS Notes that I did not know. Practical to do lists of things. 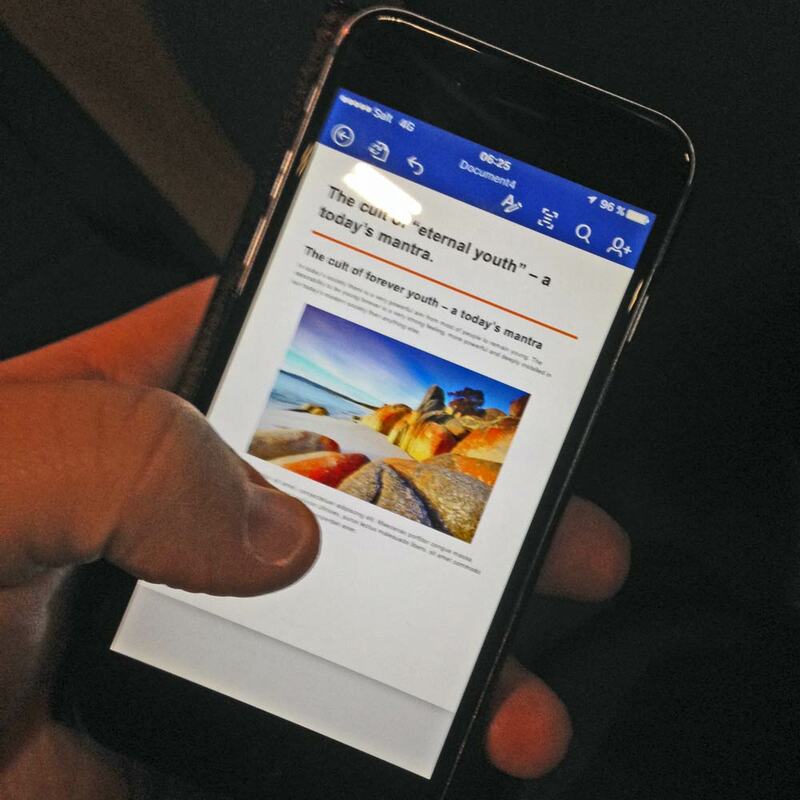 Talking about mobile, there is a great feature in the mobile version of Office 365: there is a adapted vision mode in order to make what you are writing bigger. It is much more confortable for the eyes, especially if you are writing for several minutes. This functionality was really a good one. In the image below you have the comparative. In the left side you have the entire document and in the right side the adaptative mode. 5 days after the start of the test, I got an unusual issue. I found myself in a place where there was no internet connection (no WiFi and no 4G). So when I tried to open my word document I got the following window appearing, asking me to connect or to purchase the pack. As you can imagine I could not connect, so I was blocked. According to my Office, I did not activate it. The strange point is that I have been using it for the past 5 days without any problems or any warning message. When I got a proper connection back, I opened my document without a problem and continued working. The next day I tried something: I cut the internet connection of my computer and opened the office. I got the same message. Apparently after the installation you need to activate the pack online. Unfortunately I was not aware of this as the program did not say anything. So I went back online, clicked on the Word menu and clicked on the “Activate Office” option. If you do not do it, the entire Office goes “Read-only-mode” so you cannot create or modify any document. Once it was done, I could go off-line without problems and work normally. I think Microsoft needs to activate the Office at the moment in which we add the product key. Something is missing in the process as I did not know an activation was required. Weird. In Conclusion, I think Office 365 is the perfect solution for a professional clientele. You can have a fair price for your licenses, a quite huge stockage solution and all the business functionalities integrated in one place. If you are into project management and document sharing, you will be happy. Several functionalities allow to co-work on documents. You can manage user rights and use functionalities like sharepoint, Skype and Lync in order to make your project move on. The annual renewal is something that makes completely sense for corporate business as each company can manage its users accesses. Now, from a private customer perspective, I think you do not need Office 365. It has great features but frankly you will not use half of them. You might also be able to find the same functionalities for cheaper or for free up to a certain level. The annual subscription might also be a blocking point for private customers as you might not want to pay 120CHF (110US$) every year to being able to use your Office. The “Read-only-mode” sound to me a little harsh to accept. 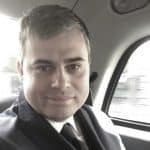 In my sense, Office 365 did not improve my blogger experience as most of the Office 365 functionalities I used were already in place for me within my Apple environment. I still believe Office in general have improved a lot. My only true concern is the installation that for me it is not yet very intuitive and clean. 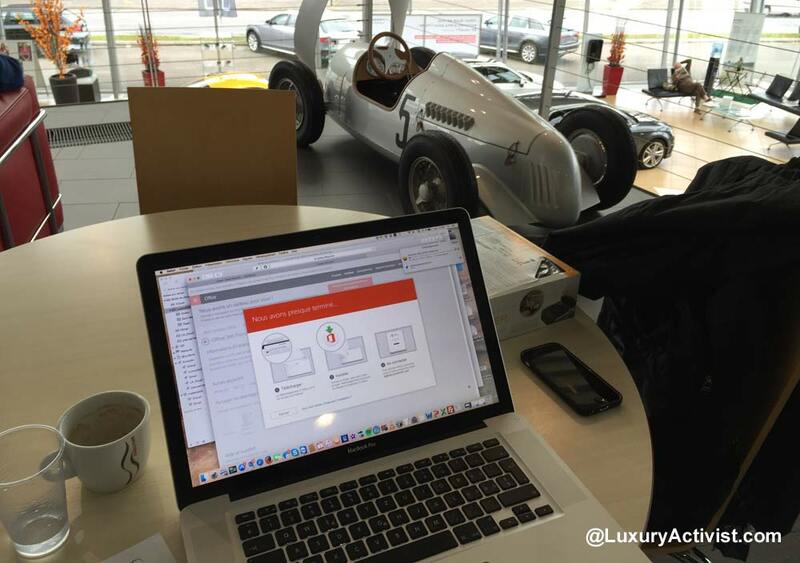 Info sourced at Microsoft Switzerland presentation in Ouchy-Lausanne and live testing by LuxuryActivist.com. All content is copyrighted with no reproduction rights available. Images are for illustration purposes only. Many Thanks to Monika Staubli for her help and generosity to make this test happen. Thanks as well for the open-mind.